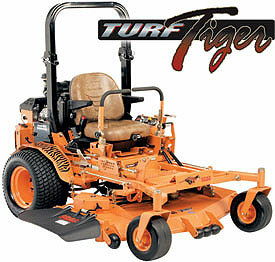 The Scag Turf Tiger is the riding mower of the working mans dreams. Having a maximum mowing speed of twelve miles per hour will allow anyone to have a speedy time while cutting the grass. This mower also delivers power to the lawn with a whopping twenty-nine horse power which is much larger then any other models. This allows climbing of the steepest hills and escapes from tricky situations. The ten gallon fuel tank provides a long lasting session and prevents frequent stops to refill. This heavy duty ride on mower provides multiple cut heights for the perfect look on your lawn. The double steel offers durability and stability for someone who is looking for a mower to last. The zero turn feature is most important. Being able to maneuver around obstacles like trees, bushes, and other things is a must. The zero turning is a system that is easy, yet precise and can be figured out in minutes. Having a large blade area of 52,” 61,” or 72” is a necessity for anyone who will take this on the go. Having 16cc of drive pump will prevent anyone from getting stuck in a bed or lacking to accelerate around a turn. The appearance is quite impressive as well. An aluminized exhaust delivers the sporty look to your lawn and also returns a sense of power. With three hundred fifty pounds per foot of stopping power the Turf Tiger can stop at high speeds, abruptly and smoothly. The Turf Tiger is very operator friendly has many pictures on controls allowing for easy transition from another mower. I've had my Turf Tiger for around 2 months now, I'm pleased to report that after spending $21,000 (AUD) I'm glad that I bought it. A little expensive, but it has a fantastic build Quality that is hard to match with any other brands, a lot local contractors around our area use these mowers, so that must mean something. They have one of the best cuts around. Clean, no divots or scalps and an even cut, nice and smooth. It must be said though, that these mowers are not ideal for up and down hills....they are predominately designed for side slopes, with the fuel tank under the seat for low centre of gravity along with a few other things this mower will mow on a side slope up to about 40 deg. I have had mine slide out on me a lot more than once using it up and down hills with a cross slope. All in all, very good machine, heaps of grunt, beautiful cut, reliability and longevity to boot. I'd buy another if I needed to. I have owned a Scag Turf Tiger with a 60 inch blade for 8 years now. This mower has its positives and negatives, but overall I am very satisfied with it. First, I will mention the positives. Most important in my opinion is the quality of the cut it makes. After completing mowing my lawn, it looks like it’s been done professionally. In fact, I notice a lot of the local landscaping companies have this type of mower, so the very high quality should be expected. This mower is equipped with zero turning radius, meaning you can get into tight spots and turn the thing on a dime. It also means that the job will be done much quicker. I have a very large lawn, about the same size as my neighbor. I can consistently complete my mowing job several hours ahead of how fast my neighbor can. Turning is done by means of two actuators with handles attached to them; it turns out to be a very good design. It has a nimble feel to it while feeling very solid as well. This mower does have its share of negatives, though. First, it is very pricy. I paid about $3,000 for my mower, which to me is quite a bit. At least you get good value for your money. Another negative is that it rides very rough. You can purchase an optional extra thick cushioned seat but it only helps a little. If the ground is very dry, it can be quite jolting if you have a rough yard. Additionally, the mower deck is not designed to float very well. In other words, many mowers have their deck that moves with the subtle contours of the ground. This deck is essentially fixed to the frame. If you need to lower the cutting depth to 2 ½ inches or less, you will need to lift the deck with the pedal as you turn so the floating wheel doesn’t cut into your lawn and leave a bare streak. Blade changes can be quite a chore. This mower has three blades. They are difficult to remove. You will need to buy an add-on called a blade buddy. This tool fits over the end of the blade to keep it from rotating while you remove the bolt from above. As well, you will need a wrench torque wrench as the blade needs to be tightened to an exact PSI. All in all, this is not a perfect mower. Its design needs tweaking a bit, but at the end of the day it will have your lawn looking professionally mowed.